Vinyard near Salem, a photo by The Bacher Family on Flickr. This is a vinyard Dad and I found while geocaching east of Salem. 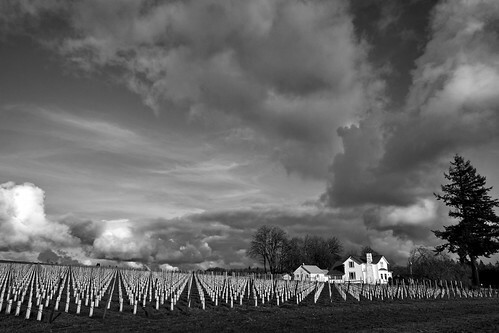 I like the contrast between the orderly rows of the vinyard and the beautiful chaos of the clouds. I also like the way the juxtaposed clouds, for me, pull my eye toward the farm house.